Yu-Gi-Oh! 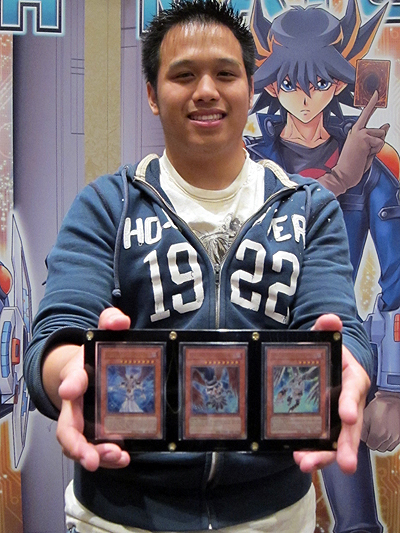 TCG Event Coverage » Thanh Nguyen wins the day with Plant Syncho! Home > 2010/10 – Philadelphia, Pennsylvania, Yu-Gi-Oh! Championship Series	> Thanh Nguyen wins the day with Plant Syncho! Thanh Nguyen wins the day with Plant Syncho! It’s been a wild ride this weekend with everything from Scraps and Naturia monster to Big Piece Golem and Darklord Desire seeing success today. In the end, the Top 4 Duelists were divided: 2 chose X-Sabers and 2 others used Decks powered by Plant monsters and Debris Dragons. While Kenny Kwan went with the traditional Quickdraw Dandywarrior build that’s won in the past Nguyen went without Quickdraw Synchron and will be going home with some fantastic prizes and the knowledge that he outlasted 930 other Duelists to become the winner of YCS Philadelphia!